Vishay Intertechnology introduced a new series of ENYCAP electrical double-layer energy storage capacitors for energy harvesting, power backup and UPS power source applications. Available in power and energy versions with high stability, Vishay BCcomponents 220 EDLC ENYCAP series devices deliver high-power density and capacitance values in small case sizes ranging from 16 mm by 20 mm to 18 mm by 31 mm. For the industrial, telecom and PC markets, the polarised energy storage capacitors offer power density up to 4,1 Wh/kg, capacitance values from 15 F to 40 F, and a maximum rated voltage of 2,7 V. 220 EDLC ENYCAP series devices feature very low internal resistance and rapid charge and discharge performance. 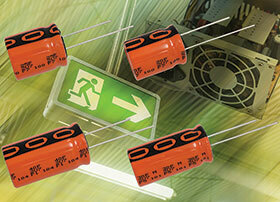 The through-hole capacitors offer long leads and are RoHS-compliant.